What Happened to Huey, Dewey, and Louie's Parents? Karla asks: I was just wondering if it’s known what ever happened to Huey, Dewey, and Louie’s parents? With open arms and a willing heart, Donald welcomed his nephews into his home. Of course, he soon realized that the “angels” and “little darlings” that Della referred to were rebellious, destructive monsters. So what happened to their dad? As Della’s letter touched upon, their dear old dad was sent to the hospital after a firework exploded under his chair- a firework placed there by his own sons: Huey, Dewey, and Louie (or perhaps it was their phantom brother, Phooey!- the mysterious fourth nephew who appeared at random times in various comic panels). This is the last we really hear about their dad. On one version of the Duck family tree, the triplets’ dad is nothing more than an obscured duck with no first name and a big question mark on his head. On other depictions of the family tree, their dad is seen as a nameless face beside his wife. His appearance on the Duck family tree is the only visual of Della’s husband. Drawing from what little information is available, Daddy Duck either died in the hospital or abandoned his kids and fled as far away as possible to avoid any more of their high jinks. If the “Donald’s brother was their father” scenario isn’t correct, given that Della was seemingly caring for the children while their father was in the hospital, it would seem to indicate that their real mother was out of the picture at this point. To make things more confusing, when Carl Barks released his version of the Duck family tree in the 1950s, he refers to the triplets’ mom as Thelma Duck (perhaps going back to the original comic book story where Della was a cousin). On this line thinking, some fans have suggested that Dumbella, Della, and Thelma are different characters, while others argue that Della is just short for Dumbella. Since the name Thelma is never used in the comics or theatrical shorts, and her name changed back to Della Duck with Don Rosa’s 1993 revised version of the Duck family tree, Thelma seems to be null and void and simply a mistake in Barks’ work. Given later story lines, it would appear the “Della and Dumbella are the same duck” theory is correct. For instance, in the comic book series, The Life and Times of Scrooge McDuck, written in the mid-1990s, Donald and Della were shown wearing identical sailor outfits as kids and depicted not only as siblings, but as twins. Thus, it would seem that when Della was originally introduced as Donald’s cousin, her character (and the boys’ backstory) was not given much of any thought as Huey, Dewey, and Louie at this point were only supposed to be around for a short visit- just a convenient plot device for an issue of the comic. However, when they put the boys in the cartoon, they decided to explain where the characters came from in a way that made a little more sense; so Donald ended with a sister, instead of a cousin, sending him his nephews. This brings us back to what happened to Della Duck. It turns out that in the Donald Duck comics and cartoons, aside from the aforementioned letter, neither parent was ever heard from again. So did they die or just abandon Huey, Dewey, and Louie? That said, while Scrooge’s frequent assertions about Donald seem to indicate Della was a dead duck, in the comic strip, Amen!, the triplets are depicted saying prayers for their mom and dad, which may indicate that they are still alive and well…somewhere. Or maybe no one bothered to tell them their parents had died. 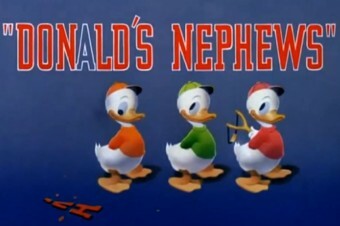 Whatever the case, in the 1942 cartoon, The New Spirit, it stated that Donald had officially adopted the triplets. As mentioned, the parents were never heard from again. Donald Fauntleroy Duck was first thought up after Walt Disney overheard Clarence Nash doing his now famous duck voice. Disney decided to hire Nash to do the voice of a duck character that would take over the role of some of the negative attributes that Mickey used to portray, but now with Mickey being a role model, could no longer do. Donald made his debut in The Wise Little Hen where he and Peter Pig tried various means to get out of doing work, such as faking stomach aches. Nash continued to do the voice of Donald for nearly a half century until he died of leukemia in 1985. Other voices done by Nash included: Daisy Duck; Huey, Dewey, and Louie; and the bullfrog in Bambi. Like any set of identical triplets, Huey, Dewey, and Louie are difficult to tell apart. Originally they were created as “one” character split into three, as was evident by the way they flawlessly finished each other’s sentences, as if they were operating off the same brain. Only when they appeared in DuckTales, and then later, Quack Pack, did they really start to exhibit individual characteristics. The only way to tell them apart was by the colors of shirts and hats they wore. However, prior to the 1980s, when they weren’t dressed identically, colors for each nephew were chosen at random and rarely consistent. Once they established signature colors for each brother, Huey was dressed in red, Dewey in blue, and Louie in green. Dave Smith, Disney’s archivist said, “Note that the brightest hue of the three is red (Huey), the color of water, dew, is blue (Dewey), and that leaves Louie, and leaves are green.” This is not to say the triplets didn’t switch it up every once in awhile or appear in colors deviating from their “signature” color. Not that it would have mattered to Donald necessarily. In the wartime short, Donald Gets Drafted, Donald Duck is shown to be colorblind, though it isn’t clear what type of colorblindness he suffers from. As if the triplet’s identities aren’t complicated enough, enter Phooey. Phooey is Donald’s phantom fourth nephew who has appeared in at least seven comic book panels over the years as a result of artistic errors not caught in time prior to publication. Huey, Dewey, and Louie joined the scouting organization, Junior Woodchucks, when they were 11 years old. Their involvement in this group is often attributed to bringing about the change in their behavior, going from rebellious monsters to fairly respectable individuals interested in helping their Uncles Donald and Scrooge in their adventures. Huey and Dewey were named after two political figures, Huey Long of Louisiana, and Admiral George Dewey of the Spanish-American War. Louis was named after Louie Schmitt, one of Disney’s animators. Their full names are Huebert, Deuteronomy, and Louis. Serving in the Navy isn’t “abandoning” your children (or the nephews you care for). Many military families do just as Donald did, leaving the kids in the care of an older relative during their deployment. I see what you’re saying, but Webster’s abandon definition 1a is “to give up to the control or influence of another person or agent”. You’re using definition 1b when you’re saying he didn’t abandon them: “to give up with the intent of never again claiming a right or interest in”. That is true, but it “may indicate” instead that the writer of the script was one of the billions of people in the world who pray (or, at least, are supposed to pray) for the souls of their deceased loved ones — namely, orthodox Jews, Moslems, the majority of Christians [Catholics and Eastern Orthodox], and possibly others. Your cousin’s kids are commonly called your nieces and nephews, even though they are actually your first cousins – once removed. They in turn call you Aunt or Uncle. All that stuff you said was jibberish. Della is Donalds sister or those ducklings would’nt be nephews!